The Saint Bernard is a giant of a dog in body and spirit. Saint Bernards used to be snow rescue dogs in the Swiss alps and it shows in their strength and thick coat. Saint Bernards are heavy shedders, droolers, and require a lot of space so a rural environment is favorable. These dogs are loving, loyal, and impressively powerful. First bred in 980 AD, the Saint Bernard was most likely the product of crossing the Tibetan Mastiff, Great Dane, Greater Swiss Mountain Dog, and the Great Pyrenees. Bred first by St. Bernard de Menthon, the Saint Bernard was used to assist people making the dangerous crossing over the Swiss Alps into Italy. Also used as a rescue dog, the Saint Bernard has saved the lives of many travelers unlucky enough to be incapacitated during their voyage. The Saint Bernard is a huge dog. They are strong, muscular animals, which is what made them such effective rescue dogs. They have a huge head with droopy jowls and a big, wide nose. There are both a long hair and a shorter hair variety, both coats being very thick and water-resistant, making them exceptional cold weather dogs. Saint Bernards are the quintessential gentle giant, being very affectionate and great with kids. Even though they are such sweethearts, they should still be socialized early to prevent any bad behaviors from becoming ingrained. They grow up fast, and it is better to teach a 20 pound puppy not to jump up or pull on the leash than it is to try and teach a 150 pound one-year-old. 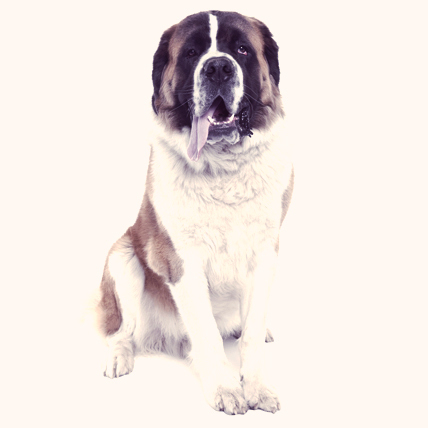 The Saint Bernard can be found in a few different colors. Some are white with red markings or red with white markings. The red is in various shades and there are also often markings of brown and yellow. For show, the dog should have a white chest, white feet, and the tip of the tail should be white.